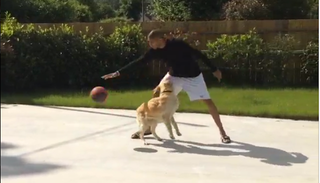 If there's an upside to Nic Batum's Blazers having been eliminated from the NBA playoffs, it's that he now gets to spend much more time playing one-on-one games with his doggie. Based on this clip, his doggie is a very good doggie. Look at that lockdown defense! And she even crashed the boards for the rebound. You can't teach instincts like that.